The Coninuing Committee is pleased to present Engage. Available for free download at trekcc.org, Engage features 53 new First Edition cards and is the second set in The Next Generation block. 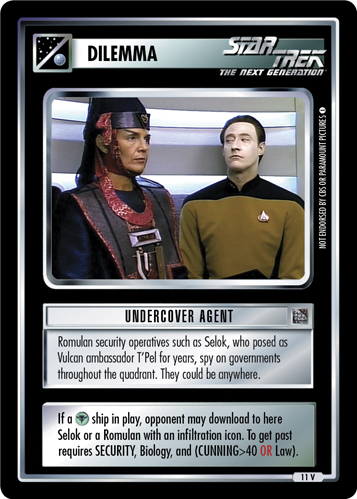 Engage introduces the Romulans to block format and also features exciting new cards for many different affiliations to use in any format. Donations of any amount ensure that we can continue to provide you a top-notch website and customer support for years to come. This expansion will be tournament legal one week from today, on Friday, November 9, 2012. Look at the tournament listings to see if there is an Engage release event near you!